The true form of luxury is individuality. ‘La Voiture Noire’ is now at the cutting edge of automobile production. It is a sculptural beauty with unique technology, the ideal grand tourisme,” says Bugatti President Stephan Winkelmann. This is a coupé with the comfort of a luxury limousine and the power of a hyper sports car. French heritage and its French identity – elegance through minimalism and refinement through intensification. This is a tailor-made creation only comparable with the haute couture of exclusive Paris fashion designers. “La Voiture Noire is a far more than a modern interpretation of Jean Bugatti’s Type 57 SC Atlantic. It is a feast of aesthetics,” says Stephan Winkelmann. With its extended front end and the distinctive Bugatti C-line, the “Voiture Noire“ creates an elongated impression with the elegant waistline defining the contours of the coupé. Purism and elegance are reflected in the surfaces and the clear lines. The bumpers are smoothly integrated into the body and the windscreen seems to flow seamlessly into the windows at the sides like the visor on a helmet. Without any irritating lines, the surface is “all of a piece” and there is nothing to disturb the optical flow. This means that the hyper sports car has changed its attitude and become a grand tourisme – ideal for comfortable travel on long trips. its incredible power and are also a tribute to the 16 cylinders. For €11 million (before tax) this unique car has already been sold to a Bugatti enthusiast. It is the most expensive new car of all time. The car enthusiast is fascinated by the Atlantic; with the “Voiture Noire“, he has acquired a vehicle that takes up the legend and carries the idea forward to the present day. 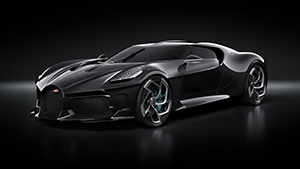 In its exclusiveness, style, quality and performance, “La Voiture Noire” is an unprecedented and unique car that continues a long tradition in the history of the automobile. Only a few months after the presentation of the Divo2, designed for even stronger lateral acceleration, Bugatti has once again shown that it has a perfect command of handcrafted coachbuilding and has reached another pinnacle in the history of the automobile. In the first few decades of its existence, the French luxury brand had considerable success not only with the design of engines and chassis but also with its own bodies installed on existing chassis. The most famous example is the Type 57 and the Atlantic GT model which was based on it – this grand tourisme could already reach a top speed in excess of 220 km/h over 80 years ago. Jean Bugatti designed the Type 57 for various body and engine configurations including the Galibier (four-door saloon), Stelvio (convertible), Ventoux (two-door saloon), and Atalante (coupé) as well as the Atlantic. Ettore’s son Jean Bugatti was a visionary who was ahead of his time. He was the eldest son of company founder Ettore Bugatti, a gifted automobile designer and natural talent who was only matched by very few people in his understanding of proportions and aerodynamics. From the late 1920s onwards, he influenced the development of the company with his own ideas and designs, before assuming responsibility for management in 1936 at the age of 27. With his pioneering designs for bodies, engines and chassis, he created some extraordinary vehicles until his tragic death in an accident in 1939, securing a place in the history of the automobile. His most beautiful and most famous design is the Atlantic. Like the company itself, Jean would have been 110 years old this year. The exclusive new “Voiture Noire“, the black car, is a reminiscence of “la Voiture Noire“ a Type 57 SC Atlantic that was Jean Bugatti’s most famous creation. The outstanding design feature was a dorsal seam running from the hinge in the split bonnet through to the rear end. The Type 57 SC Atlantic was one of the most extraordinary grands tourismes and a timeless creation. Nowadays, it is one of the most valuable classic cars in the world. Only four Atlantics were made between 1936 and 1938, each of them with detailed differences created individually for a customer. Three of these extraordinary coupés are still in existence. The second car built was used by Jean Bugatti himself as well as some of the Bugatti grand prix drivers among his friends. The world has been searching for this Atlantic for more than 80 years – it is one of the great mysteries in the history of the automobile. The car probably disappeared before the German invasion of Alsace, when it was to be dispatched to a safe region. The new “Voiture Noire“, the perfect grand tourisme, is just as exclusive, powerful and luxurious as Jean Bugatti’s historic car. “Bugatti arouses passion and emotions throughout the world. Customers expect us to continually surprise them and to raise the goalposts beyond the limits of their imagination. We have just succeeded in doing so with ‘La Voiture Noire‘,” says Stephan Winkelmann. Bugatti will continue to work hard to shape the future of the brand. This will be a future full of beauty, passion and surprises. The “Voiture Noire“ is a modern interpretation of the spirit of gran turismo vehicles, a tribute to perfect technology and perfect design. It is also the most elegant and fastest way to travel with a vehicle. Bugatti President Stephan Winkelmann: “With our automotive haute couture, we have shown what Bugatti is capable of.” Now and in the future.